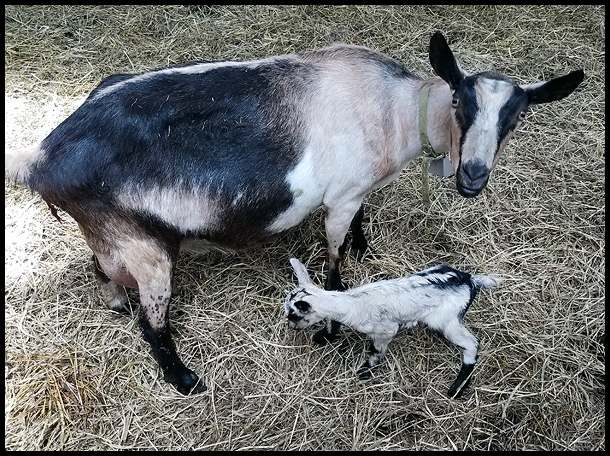 It’s July, and that means baby goats at Lively Run Dairy! 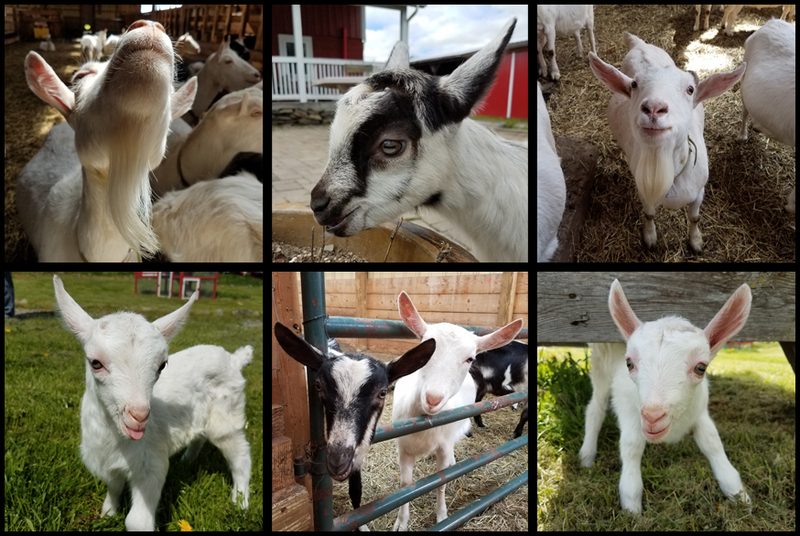 So we made ANOTHER trip out to Cayuga Lake to visit the goats, and taste some wines. (We skipped the 15 scoops of ice cream this time!) The goats were awesome, of course, and there was even a baby that had been born an hour before we got there! Mama and her 1 HOUR old baby! We visited 3 wineries, Thirsty Owl Winery, Hosmer Winery, and Buttonwood Winery. After our tasting at the last one, we opened up our picnic lunch on their covered porch, as it was raining, and they didn’t mind people hanging out even though they were closing. Another couple was enjoying some wine on the patio as well, and it turns out they own the Deerhead Lakeside Restaurant in Seneca Falls. 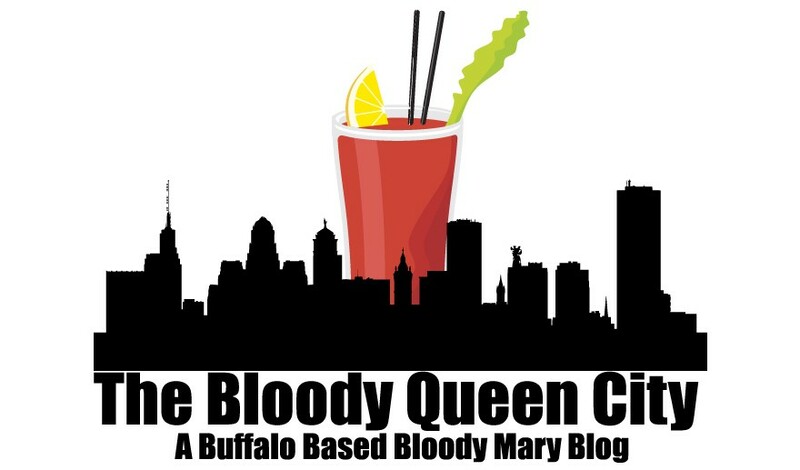 After finishing our meal, chatting with them, and finding out they offered a bloody mary we decided to stop by and try it out. Taylor was behind the bar at the restaurant, which has a great view of the lake out the back of the dining area. We told her owners Craig and his wife (I’m sorry I forgot your name!) promised she’d make me a good drink, and she took on the challenge. 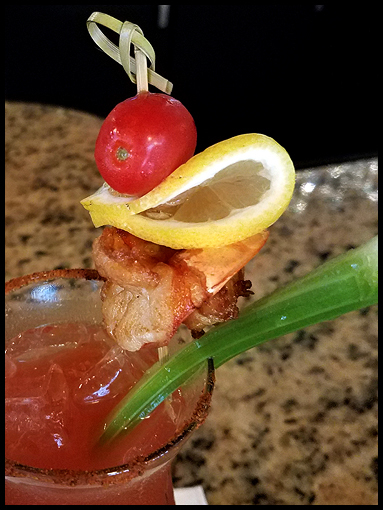 Served in a stemless hurricane type glass, the drink had a spiced rim and was garnished with celery, lemon, cherry tomato and freshly cooked shrimp. It had a very tomato-y taste, and was very spicy! 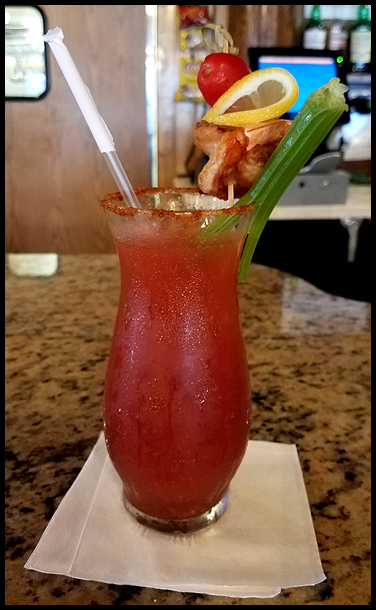 Taylor may have used a pepper vodka in it – I remember it being discussed but I’m not sure if it was used – and she added horseradish and lemon to compliment the shrimp. It was a tasty offering, from a menu that had many good looking drinks. 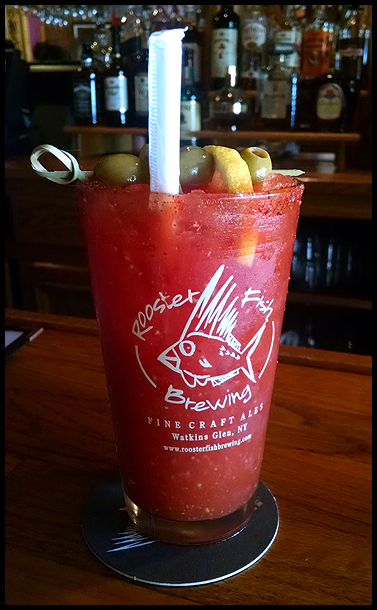 If we lived closer, or didn’t have to drive anywhere, we’d drink the menu. Since we had just eaten our picnic sandwiches, we weren’t hungry and didn’t try any of their food but the menu had many creative looking dishes, as well as standard plates. I look forward to visiting it again in the future, on another trip to see the goats surely! On vacation 2 years ago we visited the Finger Lakes, and one of the places we stopped was Lively Run Dairy on Cayuga Lake. It is a goat dairy, and their tour which included a cheese tasting, and time to meet and play with the goats, was one of the best things I’ve ever done. 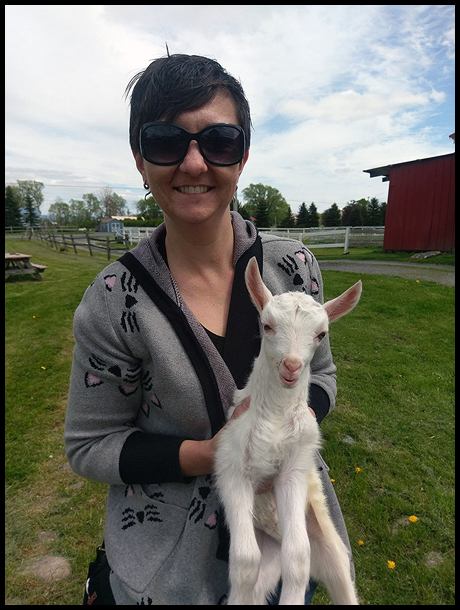 This time on vacation, I wanted to go visit the goats again, so we drove out to the dairy and met up with our friend Jenn to have some cheese, and introduce her to the goats. Oh. My. God. I love goats so much!! They only had 2 babies at the time we were there, who were 14 days old and 3 days old. They are expecting the majority of their babies to be born in July, so they should be expecting a return visit from me! 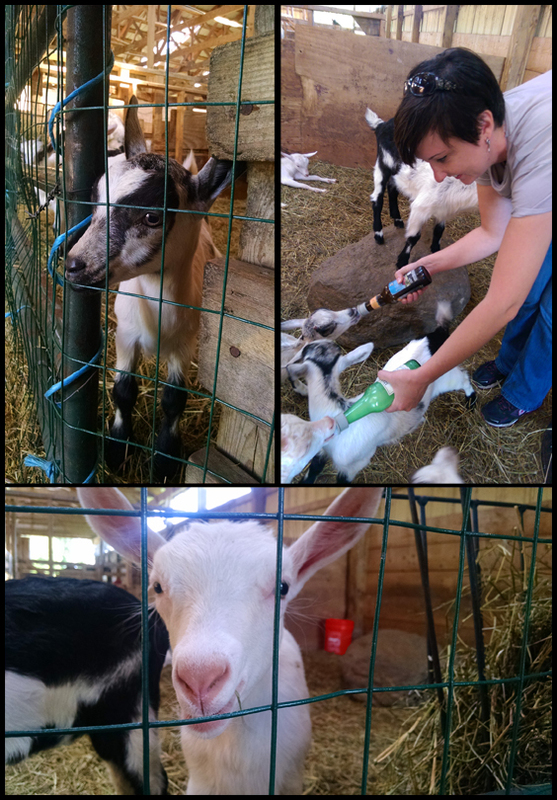 All the goats were adorable and friendly, and I want to take them home! After the dairy, and before visiting some wineries, we needed to eat so we ventured to Cayuga Lake Creamery for some sandwiches and ice cream. The Creamery’s homemade ice cream is delicious, with about 30 produced at a time. It was hard to narrow down what we wanted to try, and noticed they offered a 5 flavor tasting dish for $10, so we decided to do that. 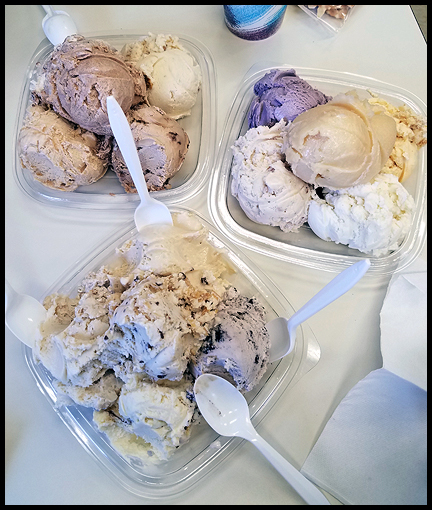 We each got one so we could try as many flavors as possible, and then this happened…. When it said “tasting” scoops, we didn’t think it would be 5 full size scoops!!! I was thinking melon baller sized scoops, or a little bigger. A few bites of each flavor, not this! We made a valiant effort, but all that ice cream defeated us. It made me sad, I hate wasting ice cream! 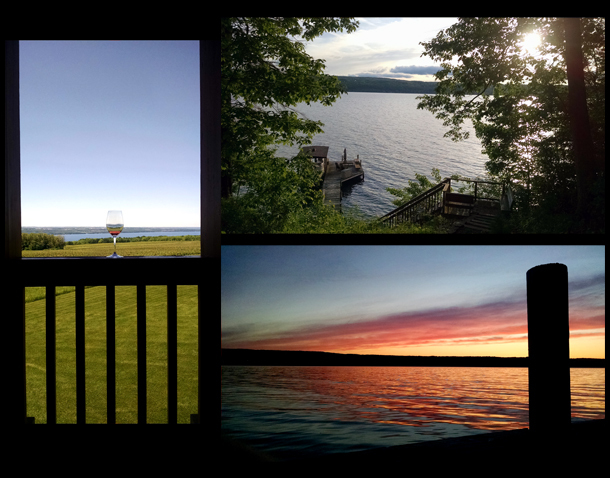 We journeyed back up Cayuga Lake to Geneva, by way of a few wineries and a local brewery, before getting some snacks at Red Dove Tavern. 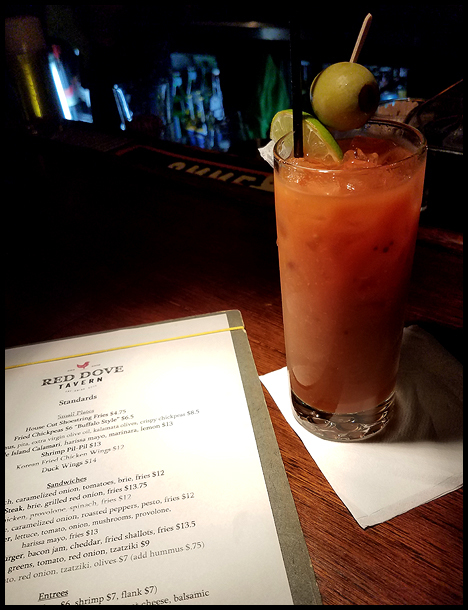 Garnished with a lime and olive, Red Dove uses a house made mix spiced with horseradish for heat. It was a tad sweet, with a good tomato flavor. Overall, a good outing, though for me it could have been a bit more spicy. Paired with their fried chick peas, we had a nice snack before saying good-bye to Jenn and heading back to Buffalo.